In this episode of the Nick Catone MMA Radio show, Tyson interviews Edson Barboza as he prepares for UFC Fight Night Brazil on March 11th vs Beneil Dariush. They discuss several topics with Edson including his current fight camp, his favorite fighters to watch, as well as thoughts on his very accomplished fight team. In addition, Tyson asks him about his very competitive division and if he has a message for young fighters and his fans. As always you can follow this show at ncmmaradio.com and on social media ncmma_radio. 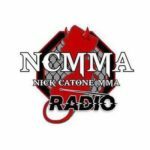 Listen to more episodes of Nick Catone MMA Radio on MyMMANews here.